Wait, what?! It's the first Saturday of the Berlinale--three days into the festival. George Clooney has already charmed the crowds and the journalists (and even Angela Merkel, too). Meryl Streep, that goddess, has been knocked down a peg with one of those Hollywood, out-of-touch-with-reality statements. When there are over 400 movies being shown in at least 10 different cinemas over 11 days, time becomes very precious. Sometimes you're in a movie and maybe it's not that great--you want to check the time to see if you can make that other film instead, but NO! No phones. That glare of brightness from your screen is annoying and distracting, so keep it in your pocket. Better to glance at a watch. Another benefit to wearing a watch during a film festival? If you're like me and running between multiple movies in a day, your phone battery is guaranteed to die. (Using Grindr to search for celebrities in town doesn't help.) Knowing the time is important and a watch battery is a million times more likely going to last. All screenings have strict "no late admittance" rules, so it's just better to be safe with your time and wear a watch. Listen, I know most festivals, events and conferences these days put out apps, but never has a festival app been so perfectly built as the Berlinale 2016 app. The official app is a wealth of information, syncing up with the berlinale.de website, your phone's calendar and providing an intensive schedule perfect for planning. The Berlinale app lets you search by movie, by category, by location or by date/time. Even with all the printed programs and schedules freely available throughout the film festival, the app is the best tool for planning. The joy of a film festival is seeing new films you might never have seen otherwise. There aren't many cinemas showing romantic comedies from Saudi Arabia, or documentaries about gay life in Korea. Use the film festival experience to explore new worlds and new ideas, and just take the risk--don't over plan your schedule and be open-minded enough to walk into a film you otherwise wouldn't. Days and days of watching new movies may seem like the dream, but if you want to remember anything at all from the festival, best to bring along a pen and notebook. Professional film critics are likely taking notes throughout the movies, but I find watching movie-after-movie, I end up forgetting details. And when it's time to come to recommend a movie to a friend, conjuring up that movie's title can be a bit of a challenge. Just a small notebook where you write down what you've seen and any brief notes can be a big help. Attending a film festival can be an exhausting experience. Even if you're basically sitting down all day, every day, in dark, quiet rooms, you're going to wear out quick. Movies can be emotionally exhausting--especially when you move between a Greek horror movie to an American comedy to a German romance film. It can really mess up your mental health moving between so many different worlds, stories and emotions. I've never been able to do more than four movies in a day, and even that is a challenge. Give yourself time between films, especially if there's a big difference in the style and emotional atmosphere. Go for a coffee or take time to chill and process your emotions. This is important. And it's a rule/tip I follow for just about every film I attend, whether it's a world premiere at the festival, or just some silly rom-com at the cineplex. Making a movie is big business. It's a billion-dollar industry in the USA alone and there are often hundreds of people, both big and small, involved with the final production. Film credits offer a window into this world, plus give validation for those involved. It's a courtesy, yes, but it's also important. Staying through the film credits, you'll get to see those details otherwise untold--film locations, musical scores, how many stunt doubles or extras or make-up artists. It's a fascinating insight into a film and even as the words scroll past at an unreadable rate, it's just enough to let you know a bit more about the film. 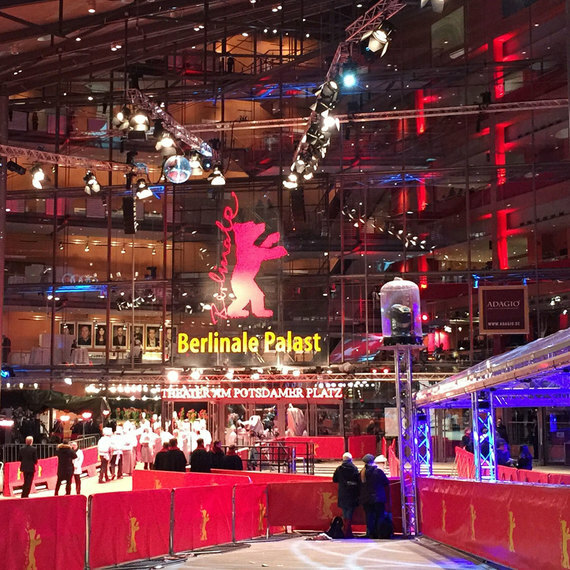 I'm at the Berlinale International Film Festival all week -- stay tuned on travelsofadam.com for frequent movies reviews and other stories from one of the world's best film festivals. For more information about the Berlinale, check their official website at berlinale.de.